Three popular consumer credit cards offer 5% bonus rewards in rotating categories – Discover it® Cash Back, Chase Freedom and Citi Dividend. 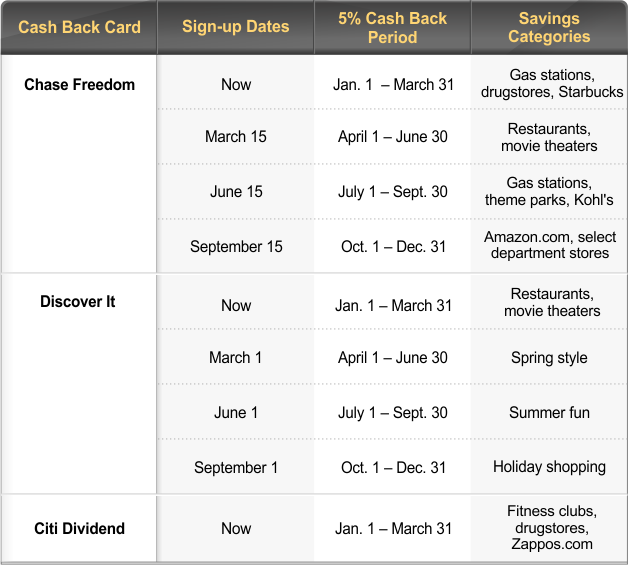 Chase Freedom has announced details for categories for each quarter. Citi Dividend has provided details for January to March. And for Discover we provide an overview of what to expect for the year. Now through the end of March, Chase Freedom cardholders can sign up to get 5% cash back on purchases made at gas stations, drugstores, and Starbucks. In the second quarter, restaurant and movie theater purchases earn 5%. From July 1to September 30, gas stations, theme parks and Kohl’s department store purchases get the bonus. From October to December, cardholders earn extra cash back at Amazon.com and select department stores that will be announced later this year. The signup period begins about two weeks before the start of the quarter. It’s not too late to sign up, as long as you do it during the bonus timeframe end. So if you miss an initial date, just remember to register before the period ends. Customers can get 5% back on a maximum of $1500 each quarter, for a total of $75. After that, they will earn an unlimited 1% back on all purchases. Citi Dividend (offer has expired) customers can currently get 5% back on Zappos.com purchases, at fitness clubs, and in drugstores. That lasts through the end of March. No information on bonus categories beyond that has been announced. Citi Dividend limits customers to a maximum of $300 in cash back per year. For Discover cardholders, January through end of March is the time to dine out and go to the movies. Restaurant and movie purchases earn the 5% bonus. From April 1 through June 30, the 5% categories will be for “Spring Style” – usually department stores, apparel and shoe stores – but details will be announced closer to the date. It’s “Summer Fun” bonus time for cardholders from July 1 through September 30. Usually that means gas stations, hotels, amusement parks and other vacation offerings. In the final quarter of the 2013, Discover cardmembers will get extra cash back for “Holiday Shopping.” Last year that included any online purchase, and may include toy stores and department stores so watch for details later this year. Maximum earning for Discover is 5% back on $1500 in purchases, and 1% thereafter. Registration for the bonus begins a month before the quarter kicks off. Cardholders must sign up for the extra 5% cash back, either online or by phone. Go to your credit card’s website and log into your account to sign up for alerts.